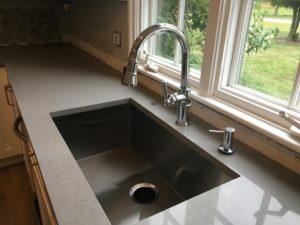 For this quartz countertop installation, we collaborated with the talented Liz Masson of Liz Masson Designs to create a kitchen that is sophisticated, inviting, and modern! 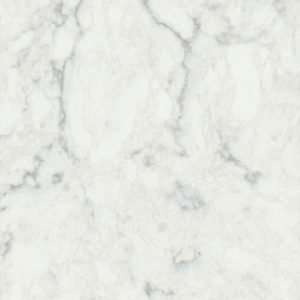 This project incorporates the newest trend in kitchen design: two-tone. 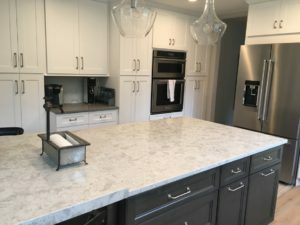 In this project, we not only had two different cabinet colors (black & white) but also two separate countertop colors as well: Fossil Gray on the perimeter of the kitchen and Pelican White for the island (Q Quartz by MSI.) 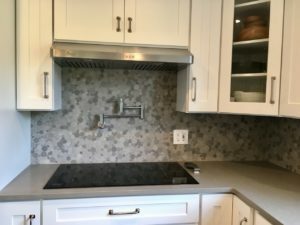 When implementing two different stones on a quartz countertop installation project, the colors have to not only complement each other, but also the cabinetry, backsplash, and paint/wall coverings. This project doesn’t disappoint! 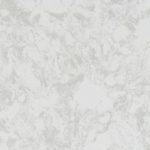 Fossil Gray lines out the the entire perimeter of the kitchen. 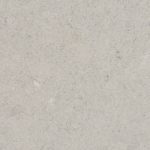 The soft gray color with very light veining plays off the pebble backsplash perfectly. It also plays nicely with the stainless appliances, cabinet hardware, sink, and faucet. A pot filler right above the cooktop makes cooking spaghetti or boiling eggs simple and easy. A large Alba handmade sink is perfect for dishes, pots, and pans, both large and small. Pelican White sits atop a unique island. When we came to the job site, one of things the homeowner was concerned about was having a large seating area at the island. 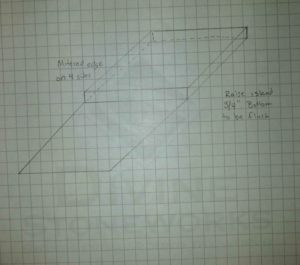 However, the size they wanted the island to be, it would have caused a seam to be right in the middle of it. So we put our heads together and came up with a solution. To incorporate a large seating area, we had the contractor raise the area that the overhang would be by 3/4″ thus allowing us to have a separate seating area from the “workable” area of the lower part of the island. The result was a dramatic look that makes it appear as if the stone is larger for the seating area.To create this look, we did a mitered edge around the perimeter of the seating area. 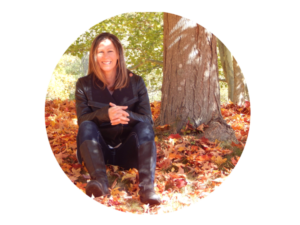 Consistently coming up with creative solutions and wowing our clients is what it’s all about!